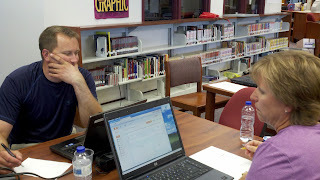 To create a blog from scratch, I walked two teachers through a short step by step process. Choose a template (this can be changed later) don't spend too much time at this point deciding. Start with SIMPLE. The dynamic gets slightly complicated. You may be asked to create a profile. Just choose the left "limited blogger" profile. The title of your blog will be in the middle of the screen. Click on it. On the left side, will be a list of nine words. Numerous sections will be in your blog. You can decide which sections you want. The main section "Blog Posts" is a section you will want to keep. This will be where you make the content of each day known. This section will allow you to add or delete any gadget that you want. Gadgets are tools that can be added. If you are unsure of choosing GADGETS, now will be a great time to contact me for additional help. IMPORTANT: a navigation bar always exists in a Google Blog. Use the following code to remove the navigation bar so students cannot advanced to a random blog. The complete directions are here.